Pretty much any hard and heatproof material you can think of could be used to make cookware. Some manufacturers have tried glass and ceramics, and the tagines of North Africa are made from earthenware — but usually we rely on metals for pots and pans. Stainless steel, cast iron and copper all have their fans, but most cookware in North America is made of aluminum. The best aluminum cookware is usually hard anodized, a term which requires some explaining. 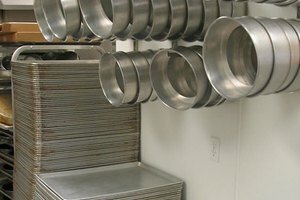 Plain aluminum is a great choice for cookware, for a lot of reasons. For starters it's a super-common material, one of the most common elements on the planet, which means it's cheap and readily available. It's also lightweight, so it's easy to sling around even when your pots and pans are full. Best of all, it's one of the best conductors there is for heat. 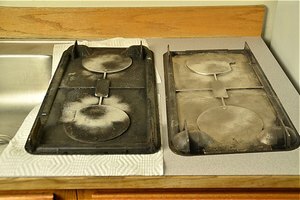 Your food will cook quickly and evenly, and your pans will respond quickly when you raise or lower the heat. The downside is that plain aluminum is soft and highly reactive. It can easily dent or warp, and it'll also react with the food you're cooking. Acidic foods, in particular, can be discolored by aluminum, as you may have learned if you've ever covered a plate of spaghetti with foil. Getting a bit of aluminum in your food isn't a health risk and won't cause Alzheimer's — dubious websites notwithstanding — but it makes your food look weird and can give it an unpleasantly metallic taste. That layer of oxide isn't very durable, though, so manufacturers developed anodized aluminum as a way to take the whole passivation concept to the next level. It's a simple process, in theory. You just dunk the aluminum item in an acid bath, with an electrical wire attached. Then you provide a negative terminal at one side of the water bath, and turn on the electricity. This is how the aluminum becomes anodized, meaning it acts as the anode in the circuit and attracts oxygen ions from the acid bath. The oxygen bonds permanently to the aluminum, changing its structure at the molecular level. The new surface is hard and durable, and it can't flake or chip off because it's actually part of the aluminum itself. Cookware made from hard anodized aluminum keeps all the same advantages you'd get with plain aluminum: It's lightweight, it's inexpensive — though a bit costlier than plain aluminum — and it's an excellent heat conductor. Compared to plain aluminum, it's also physically tougher and stronger, and it won't react with your food anymore. The hard anodized surface isn't especially sticky but it isn't nonstick either, so manufacturers often complement the standard aluminum surface with a nonstick coating. 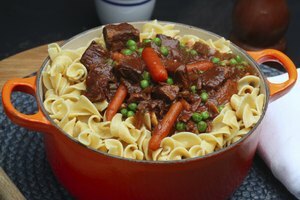 Some cooks prefer pans without a coating, at least for some uses, because foods brown better if they're in a pan that allows foods to adhere slightly. 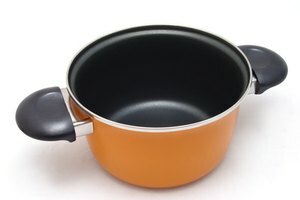 Hard anodized cookware is suitable for most gas or electric stoves, but not for modern induction cooktops. Those only work with ferrous metals, the kind a magnet can stick to. Manufacturers can work around that, as needed, by sandwiching a layer of ferrous material inside the base of an anodized aluminum pan. It'll heat and cool more slowly than the aluminum, but you will be able to use the pan with induction cooktops as well as conventional ones. Circulon: What is Anodized Aluminum? Aluminum Anodizers Council: What is Anodizing?